Nyamme Sherab Gyaltsen was born in 1356 in Gyarong in the village of Tegchog, East Tibet and is considered to be a manifestation of She-rab Ma-we Seng-Ge (the Wisdom Lion of Speech) the great liberator. His father was a Tantric master known as Lugyal from the Ra lineage and his mother was Rinchen Men. From early childhood, he was recognized as an extraordinary child: without studying, he could recite mantras, remember and learn spiritual texts easily and was also self-aware. After discovering at the age of 10 the suffering of cyclic existence, he followed the teacher Chala Yungdung Gyaltsen, soon became a monk, took 25 vows and was given the spiritual name Sherab Gyaltsen. From then on he received the higher teachings of Bön: Dho – the Path of Renunciation, Nag – the Path of Transformation, and Dzogchen – the Path of Self Liberation. With great devotion he practiced and learned mainly from the teaching tradition of Yeru Monastery and by following the Great Master Rinchen Lodoe. 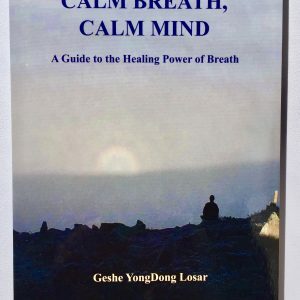 Nyamme Sherab Gyaltsen received complete transmission of empowerment (wang), oral transmission (lung), and oral instruction (tri) of the three main streams of Bön teaching: Dho, Ngag, and Dzogchen. He received fully-ordained monks’ vows at the age of 31 and entered into the great center of learning of Bön – the Yeru Monastery in Tsang province. By participating in many other renowned Buddhist institutions and monasteries, he became very well known in Tibet and was recognized as a great wisdom scholar. During his stay at the Yeru monastery, he took charge of one of the schools. He also became a tutor of two royal sons of Dru lineages and was enthroned as the successor of Kunga Wangden, the famous master of the Dru lineages. 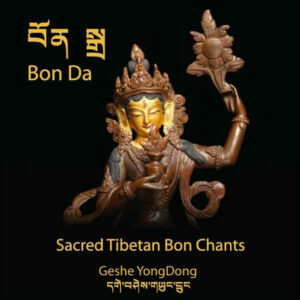 Through his work he preserved and spread the outer, inner and secret teachings of Bön. 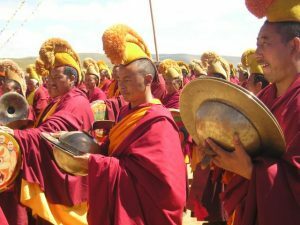 From that time forward, every monastery has followed the exact same clear knowledge of the ancient system of monastic laws brought to life by Nyamme Sherab Gyaltsen. In 1405, he founded the original Menri Monastery known as Tashi Menri Ling in the mountains. Bön protectors directed him as to where exactly he should build Menri Monastery. With support from them and miraculous powers, he built the whole structure of Menri Temple including the monks’ living quarters. He decided to preserve there the traditions and teaching system of the destroyed Yeru Wensakha monastery. Tashi Menri Ling Monastery soon became the mother monastery of Bön. 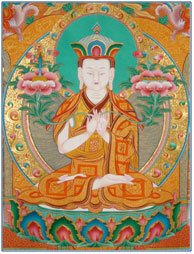 Nyamme Sherab Gyaltsen became the crowning ornament of Bön for his mastery of text, systems and rules; he came to be considered as the second Buddha. There really are no texts from these three sections of Dho, Ngag and Dzogchen that he did not teach or write about in all of the three transmission lineages of Bön. He passed away at the age of 60, leaving behind many great scholars and practitioners.